Aspiring ballerina Dani Spevak is thrilled when hit TV show Teen Celebrity Dance Off comes to the campus of her performing arts boarding school. She trades the barre for the ballroom and gets set to cha-cha-cha to stardom with Hollywood wonderboy Nick Galliano. It’s like Nancy Drew in toe shoes in this light-hearted tween mystery, a finalist for Romance Writers of America’s Golden Heart® Award for Best Young Adult Romance. This book was a lot of fun! It was a perfect example of YA done right. It was a fast, light read with a good mystery and an even better message. 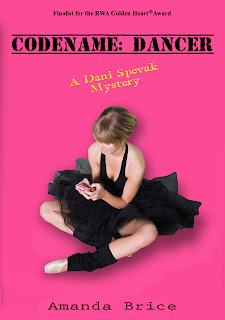 Dani is a 14 year-old dancer who is new to a performing arts boarding school. She makes fast friends with some other dancers and they audition for the coveted spots on the Teen Celebrity Dance Off team. After the team members are chosen and rehearsals begin, things start to go wrong. Dani and her friends set out to solve the mystery of who is sabotaging the show. In the middle of their hunt for the guilty party is a blossoming romance and Dani's struggle with her body image. There were hints as to Dani's body image issues throughout the book before it was expressly discussed. Being a dancer, you can imagine the focus on weight these girls feel and Dani feels pressured to lose weight to look good on stage and fit into her costumes. I loved how Brice used her book as an opportunity to send a great message to her readers. Another thing I liked about Codename Dancer was Dani's voice. She's perky and kind of sassy. I liked Brice's references to pop culture. I thought they were very well-done without being heavy-handed (like, say, the House of Night series). I would recommend Codename Dancer for a younger YA audience. Middle grade fans especially will love it. I liked the book much more than I thought I would and would definitely read more from Amanda Brice in the future. This sounds like a really interesting take on the recent obsession with reality TV. I was surprised to find from your review that the protagonist is only fourteen, and I'm curious as to how that will affect the unfolding of the story. I might pick this up for my younger sister! Thanks for the review. This book is great. I am almost finished! And I don't read YA. Love this blog and the review. Thanks for sharing.